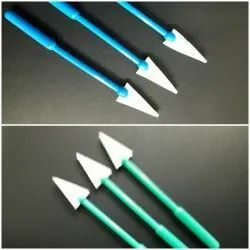 - High soaking capacity cellulose sponge spears mounted on plastic handles. - Used to wipe blood and soak fluids. - Fast wicking, micropoint absorbent. - Extremely strong, will not tear or shred. 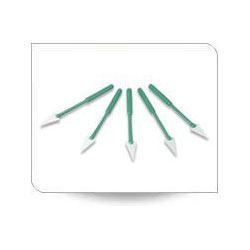 - Pack of 2 or 5 spears (sterile). DescriptionHigh soaking capacity cellulose sponge spears mounted on plastic handles. Used to wipe blood and soak fluids. Fast wicking, micropoint absorbent. Extremely strong, will not tear or shred. Disposable & sterile. We are involved in offering high quality Cellulose Sponge. These are widely appreciated by our clients which are situated all round the nation. We offer these at market leading prices. High soaking capacity cellulose sponge spears mounted on plastic handles. Used to wipe blood and soak fluids. Fast wicking, micropoint absorbent. Extremely strong, will not tear or shred. Disposable & sterile. We offer a wide range of disposable and sterile cellulose sponge drain, that find application in ophthalmic surgical activities. These are manufactured using high quality cellulose sponge and find usage in draining excess fluid in deep  set eyes. We are offering to our client an excellent range of Cellulose Wipes, these product are available at very reasonable price. Cellulose Wipes offered by us are safe in use with uninterrupted performance. These product are manufactured using by excellent quality of material. As per the needs and requirements of our clients, we are involved in providing Compressed Cellulose Sponge. Premium cellulose based wipes with 20X absorption. They are 100% biodegradable, hygienic, long lasting, lint free, soft and pliable. Their applications range from cleaning refrigerators, dining tables, kitchen platforms, sinks, glassware, windows to automotive and electrical home appliances such as TV, DVD players etc. - Constructed of the finest compressed cellulose sponge material securely molded to a Polypropylene handle. - High volume fast wicking action for absorption of blood and fluids within the operational field. All Environmental sampling sponges are manufactured with Biocide free cellulose sponge to maintain organism viability. They come supplied with a write-on label printed on a leak resistant sample bag. Provided with or without gloves and with different medias to cater for all customer needs. With an objective to fulfill the ever-evolving demands of our clients, we are engaged in offering a wide assortment of Cellulose Wipes.